How to Make Precision Distance & Width of Columns in Microsoft Word. After making a column written in the document, we sometimes need to adjust the spacing between columns by dragging the mouse. But the spacing is less precise or only be guessed at. To be able to make more precise distance between the columns of 1 cm or 1 inch for example, you can use the following steps in Microsoft Word 2007. Click on or place the text cursor in text fields that you want to change the distance between columns. You will be given a Column dialog that allows you to organize your writing the column configuration. 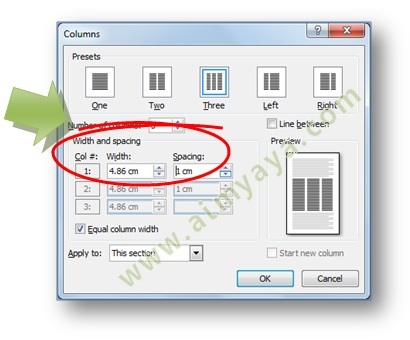 On the width and spacing grup, fill the column width in the Width box, while to adjust the spacing between the columns fill the distance between columns in the Spacing box. Make sure that you fill value is to your liking and then press the OK button. When you arrange or provide value for the column width, the spacing between the columns will be adjusted automatically by Microsoft Word and vice versa. When you set the value of space between the columns so the column width is automatically adjusted. 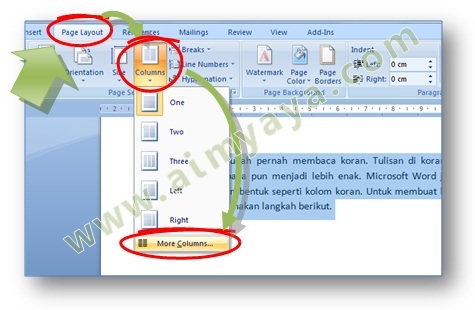 Thank you for reading How to Make Precision Distance & Width of Columns in Microsoft Word.